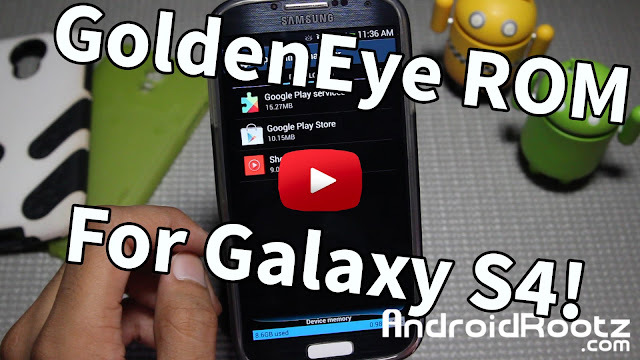 GoldenEye ROM for Galaxy S4! [App2SD] GT-i9505/T-Mobile/AT&T/Canadian ~ AndroidRootz.com | Source for Android Rooting, ROMS, Tricks and More! Back a couple of months ago we took a look at GoldenEye ROM that was only available for the AT&T Galaxy S4, but now it's available for the GT-i9505, T-Mobile, AT&T, and Canadian variants. This ROM is very simple, but still brings some features to the table! GoldenEye ROM is based off Touchwiz that comes deblaoted removing all the carrier and most of the Samsung's junk leaving you with a clean and light ROM! You also get some neat features like the Android keyboard, WiFi tether (depending on what carrier your using this on), and App2SD! The App2SD is the main and probably the best feature in this ROM, this allows you to move app data from your internal memeory to your external SD card, giving you more internal space! Download GoldenEye ROM for Galaxy S4 GT-i9505, T-Mobile, AT&T, and Canadian variants below! Please Check Out The Galaxy S4 FAQ Section Before Commenting!